On October 23, I'll be giving a presentation as part of the Life Long Learning series in East Greenville, Pennsylvania. My topic will be Napoleon's 1812 invasion of Russia which is, of course, the backdrop for my book, Russian Snows. I won't be speaking about my book, however. Rather I'll be talking about the campaign and working in some of the eyewitness accounts that I have been blogging about at www.Napoleon1812.wordpress.com. If anyone is local to the East Greenville area (southeastern Pennsylvania) and is willing to plunk down $15 to register for the series is invited to come out to my 9:30 am presentation on Tuesday, October 23. Additional information and registration information for LLL is available by following this link. Today I talked to the middle school students at West-Mont about the history of Napoleon's invasion of Russia, my background with re-enacting and how, with God's blessings, it all came together in the writing of Russian Snows. I had a great time and the audience was very well behaved and attentive. I have begun to edit the sequel to Russian Snows, Paris Winter: Fall of the Empire. The process is slow as I'm still working on promoting Russian Snows and finishing my blog about the 1812 invasion of Russia. It was on this date in 1812 that the Grande Armee left Russia. Paris Winter: Fall of the Empire was a winner in the 2011 National Novel Writing Month competition. The goal of NaNoWriMo is to write 50k words of a novel in the month of November. Over 250,000 people signed up to make the attempt, only 14% were successful. I'm at the 25% mark against the November NaNoWriMo challenge. A little behind schedule, but plan to catch up soon. 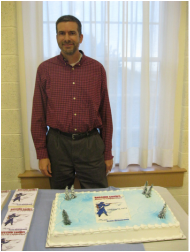 I held the book launch for Russian Snows last night at Cedarville United Methodist Church's weekly Cedarville Nights dinner. People came for a great dinner and also got to see a book launch and have some cake. The best part was being able to autograph copies of Russian Snows for people who bought a copy.